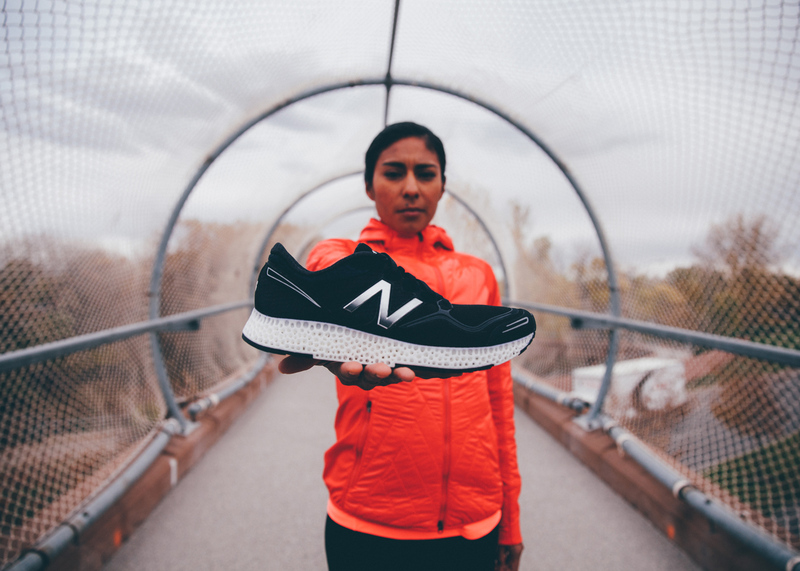 Footwear brand New Balance has followed Adidas in developing 3D-printed midsoles that could be customised to suit the runner's individual pace. The American brand partnered with Massachusetts design studio Nervous System to develop the prototype soles, which were are based on foot pressure data recorded from several runners. "New Balance came to us with a problem," said Nervous System. "They wanted to improve the design and creation of their 3D-printed midsoles to better adapt to performance data from runners." The studio carried out a set of experiments at the company's Sports Research Lab in Massachusetts, using a grid of underfoot sensors that recorded the force as the foot strikes the ground and pushes off. Nervous System also researched naturally occurring foams, including those that make up wood or bone, and used this information to develop a 3D-printed foam-like structure that can be manufactured quickly. Using selective laser sintering and a flexible elastomer, the team were able to create variable midsoles that could be immediately tested on runners' feet. "Foam structures are three-dimensional arrays of cells," said Nervous System. "They have a low relative density and are highly porous, giving them the unique property of being both lightweight and strong." "We wanted to use the running data to design foams that geometrically adapt to different forces," they added. The prototype shoes feature flexible porous soles with smaller, more closely gathered holes in areas of the shoe where the foot requires more support – such as the heel and ball. Much like the Adidas Futurecraft sole – which featured a lattice-like 3D-printed sole – New Balance intends to use the technology to produce shoes that are minutely customised to different runners' feet. "This project represents an unprecedented technical collaboration in footwear," said Sean Murphy, senior manager of innovation and engineering at New Balance. "To deliver this level of performance with a 3D-printed component, we paired experts in running and biomechanics with leaders in plastics engineering, material development and generative design," he added. "These are the types of collaborations that will drive footwear design and manufacturing in the future." New Balance footwear with 3D-printed midsoles will go on sale in April 2016, and the company says customised versions will be available from 2017. 3D printing is being investigated by various sportswear companies for the possibilities it offers for customised clothes and footwear. Other examples include Nike's American football boots that incorporate Flyknit technology with 3D-printed cleats.